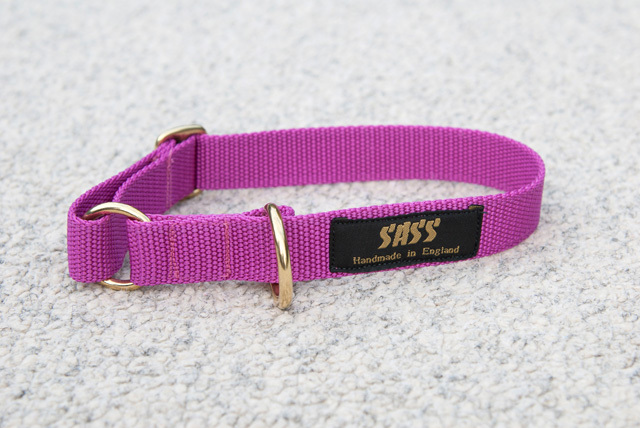 The adjustable ring collar has no buckle for fastening and therefore no set holes for adjustment. You slip it over the dogs head and adjust the size by pulling the slider until it is a comfortable fit. It is infinitely adjustable within the size range of your chosen collar. We have two sizes of collar to choose from, both with generous adjustment ranges. Available in 10 different colours. The collar has a ring for attaching either a clip lead or a ring lead.